Matt Smith» Blog Archive » Voice and Integrated Computing: What Now? Voice and Integrated Computing: What Now? Fast-forward to late last week. I had a fascinating conversation with Georgia Tech’s Keith McGreggor about what Siri is beginning to do to the way we interact with devices. My initial thoughts were (and to a small degree still are) that it’s unnatural to talk to a phone for the purpose of voice commands. Granted, the same thing is essentially happening when you’re talking on the phone or on Skype, but in that case, you know that an actual person is on the other end. But in the case of Siri, is there a person on the other end? We’re starting to see the personification of computing; you’re not talking to the “Voice Activated Command Module”, you’re talking to Siri. When the release first came out, I was a little confused as to why Apple didn’t rebrand Siri to something more Apple-esque, like “Assistant” or “Navigator”. But then I thought about the personal touch that “Siri” gives. There’s even a few people named Siri. It’s human, it’s natural, and it works. To take it a step further, it’s really mind-blowing to think about what happens if (but more likely when) this voice interaction becomes not only natural and comfortable, but integrated with everything we do. Keith mentioned the idea of building Siri into Apple TV and being able to walk into the living room, sit down, and say “Let’s watch some football.” (I wouldn’t say that myself, but you get the point). Even cooler would be to see this tie into an Internet of Things – walk into your kitchen, say “Huh, I’m feeling like some toast”, and have two slices of bread drop from the celling into a just-activated toaster. Slight joke, but the idea stands. When Siri opens up and becomes a platform, a medium for other devices, that’s where it gets big. And we’re only at the beginning of the beginning. This entry was posted on Monday, October 24th, 2011 at 3:08 pm and is filed under Apple. You can follow any responses to this entry through the RSS 2.0 feed. You can leave a response, or trackback from your own site. I love your blog posts! You haven’t posted in a while… I was thinking about how Siri would change things also. Maybe make other people and companies more interested in AI since Apple has a winner now. It got me more interested in AI, if I knew how I would code a AI right now. Seems like it would be something fun to create, plus I could be its daddy! Other people/companies might want to try to do build AI like Siri now which lead to more AI and other interesting things I would hope for everyone no matter what platform. 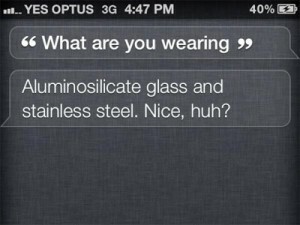 I would love to see a open source project like Siri. Couldn’t agree more. My first reaction, nah, not that interesting. After thinking about it for a while…huge potential. I immerse myself in computing and its relation to media, design, and business. I'm an addict to tech news, the social web, and enjoy writing, speaking, and sporadic coding. I'm also a huge gadget nerd. Personally, I like good food, coffee, and discovering new places. Let's talk. Email me at m at themattsmith.net.